The emergency department is staffed 24 hours a day, seven days a week, for emergent care and treatment by contracted physicians from DOCS Emergency Medicine. We have on-call lab technicians and radiology staff readily available. We measure our patient satisfaction through a patient survey that goes out to all of our patients. Our percentile score (ranking us against national facilities in the Press Ganey database) is consistently above our 94th percentile target, ending fiscal year 2015 at 96th percentile. Our Emergency Department staff received the Guardian of Excellence Award from Press Ganey for our outstanding patient service in 2014. Clarke County Hospital is a Level IV Trauma Center. This designation identifies our ability to provide trauma services and have patients transported, as needed, to a hospital equipped to provide necessary services. We also have a helipad on-site that allows for LifeFlight to land and quickly transfer patients to larger hospitals when needed. 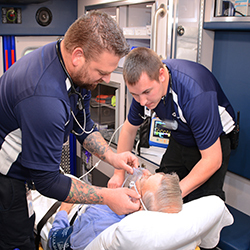 We employ 12 nurses available to staff the emergency department, as well as 20 EMS personnel. All emergency nurses and paramedics have advanced training in trauma, PALS (pediatric advanced life support), ACLS (advanced cardiac life support), TNCC (Trauma Nursing Core Course). In addition to the emergency department, Clarke County Hospital also provides a hospital-based 911 ambulance service 24 hours/day, seven days a week that consists of 16 EMT staff members and 3 ambulance vehicles. This team is also available to transport patients to a higher level of care when indicated. On average, the CCH Ambulance team receives over 1200 calls per year. Our Ambulance staff proudly serves the community by participating in local events and providing standby at the Clarke and Murray football games. Dial 911 - and Clarke County Hospital ambulance will transport you to the emergency room. Routine: These types of health problems will often get better with self care including over-the-counter medications. See your doctor within several days. Urgent: These health problems should be seen the same day by a physician, but are not emergencies. Call your physician if the problem is not life threatening and time is not of the essence. Emergency: Emergencies are conditions that require immediate care. If necessary, call 911 for an ambulance.